I was visiting my mom and while we were chatting she got this conspiratorial look on her face and says, "If I show you something, you promise not to tell anybody?" "I got some lotion that's supposed to be good for my arthritis." And she shows me this. From their web site: Ultimate gift for your hands and feet. Great for all over! Premium Cannabis Flower and tea tree kill bacteria and fungus that create infections, foot odor and athlete’s foot. 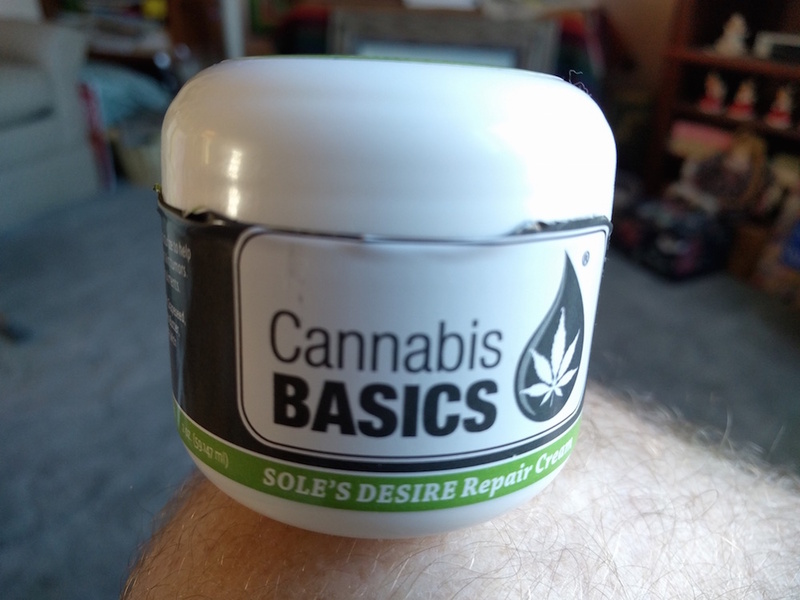 Premium Cannabis Flower and arnica montana treat the pain, swelling and bruising of muscles and joints, headaches, migraines and symptoms of PMS. Together they relieve symptoms from arthritis, tendonitis, fibromyalgia, multiple sclerosis, lupus, and diabetes. Organic Hempseed Oil nourishes, protects and helps soften dry, callous skin. Great for rashes, burns and skin tumors. Helps with symptoms of eczema, psoriasis and other skin ailments. Massage area and feel the satisfying tingle while you are bathed in the healing powers of topical cannabis. Which, as far as I'm concerned, is awesome. If it works for her, great. Even if it's just a placebo effect. Then mom start told me about how she told other people and instructed them that "mum's the word" to which I replied, "Mom, if you're telling everybody then mum is not the word." The cannabis ingredient is hempseed oil, which does not get you high. And the label states the lotion does not contain any psychoactive ingredients. But I noticed a new shelf in mom's kitchen. I can imagine mom getting pulled over for a traffic stop and I see her throwing a jar and maybe a tube of lotion out of the window in hopes she doesn't get busted. "It's not mine. It's my friend's. I have never used that stuff for my arthritis, officer." Heck, I was sworn to secrecy and now it is all over the web. Guaranteed not to rip, rattle, tear, run, split, wear at the seams, non-skid puncture-proof . . . and if you don't buy it somebody else will! While Kathy was home helping her sister, her nephew came up and asked if she could keep a secret. Then he told her that he got his girlfriend pregnant. She said, "I know," and he got upset. "Who told you?" Kathy started naming off his siblings and cousins. "They were supposed to keep it a secret!"